Our insights, blueprints and prototypes may fail to stand up to an onslaught of objections. During implementation, our goal warps and cracks until it is barely recognisable, diminishing the value of our efforts and of the service. 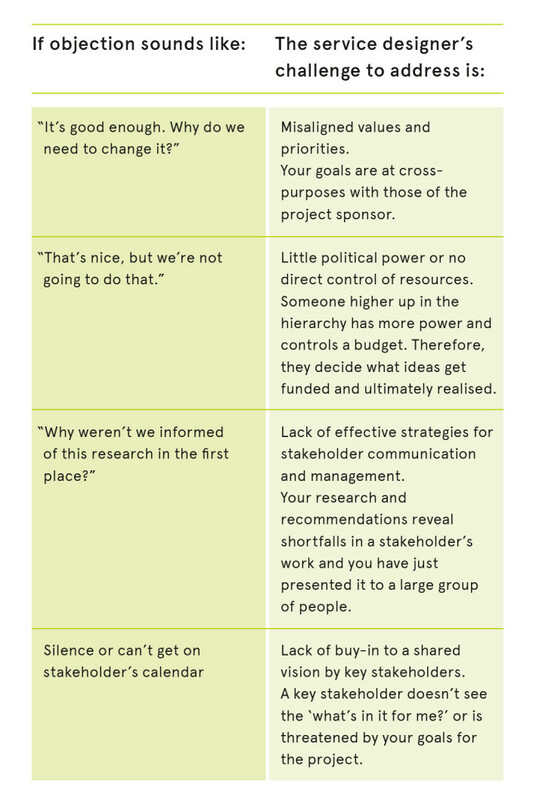 We set out to understand why these objections arise by interviewing 13 senior level service designers across academic, commercial and non-profit sectors, as well as an organisational psychologist. tools to help service designers with some of the most challenging aspects of team-building and collaboration. “The essence of team building is ‘in-group/out-group’,” says Reza Ahmadi, an organisational psychologist. 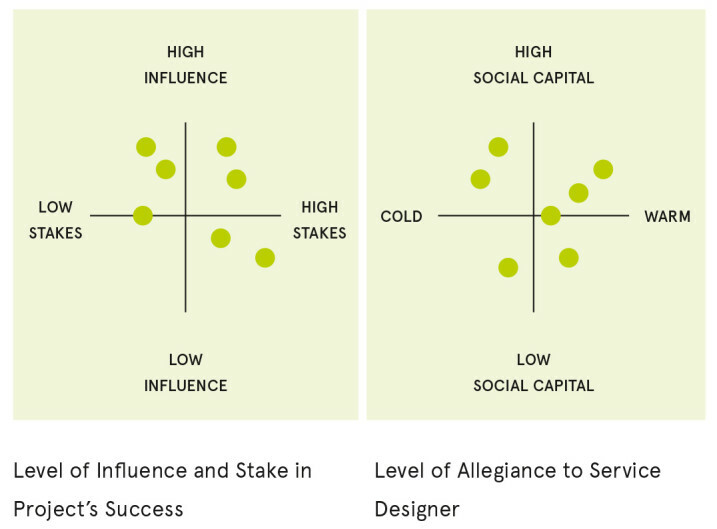 To be successful, service designers must know how to influence stakeholders, align their goals, and motivate them to prioritise the customer’s needs throughout the project lifecycle, and perhaps beyond. We present two toolkits for service designers to influence and manage stakeholder relationships successfully. Everyone we spoke to agreed that a successful project meant having the right people engaged early on. They reported spending three times as much time on stakeholder engagement than they had planned, and one spent 80 percent of her time, on average, engaging with internal stakeholders. Instructions: Post prompting questions. Using sticky notes, write names of all stakeholders relevant to each question. Include titles and departments. Who will be the project decision makers? Our research confirmed that it is essential to have the right support from executives who communicate the project as a priority. Some interviewees said they would not take on a project without that level of executive support. Checking for executive sponsor is imperative because service designers often have little power and no direct access to key resources. If they have high visibility and other high profile projects, it brings valuable clout and credibility to the project and team. Who is working on related projects? Are there opportunities to align or collaborate? Who could obstruct the project? Who else could support this project? To attract the right partners, think of who the project might be a ‘win’ opportunity for. Move the sticky notes from the previous exercise onto a matrix of Influence vs. Stakes. ‘Influence’ refers to an individual’s clout within an organisation and ‘Stakes’ demonstrates their level of investment in the success of the project. 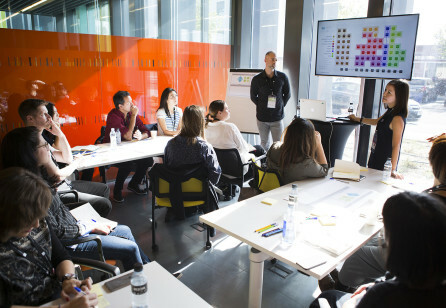 Once all sticky notes are plotted, use a marker to indicate their ‘Customer Degree of Separation’ – how removed they are from interactions with a customer at a touchpoint. Use a 1-5 scale, ‘1’ being someone with direct contact with customers (e.g. the person is a support representative) to ‘5’ for those who are four or more levels removed from customers. On a separate sheet, indicate the ‘Temperature’ of each person, reflecting their attitude toward the project as ‘Warm’ or ‘Cold’. Combined, these two maps will give you a sense of how much time and effort will be needed to bring certain people on board, who can be activated immediately and who should be ‘benched’ in early stages. Translate your findings into a working document with all information from the previous activities. Then decide how to best engage each individual. Using a high level journey map(s), place sticky notes identifying what matters most to the customer — their desired outcomes — at each stage. Number the metrics in sequence. These are the ‘Key Experience Indicators’ — the metrics you will care about most throughout the project. Use these as your own goals and metrics in the next exercise. Set up a 1 to 1.5-hour workshop to co-define individual, organisational and project success metrics with all stakeholders. Have each stakeholder write their primary goal or desired outcome(s) for the project. 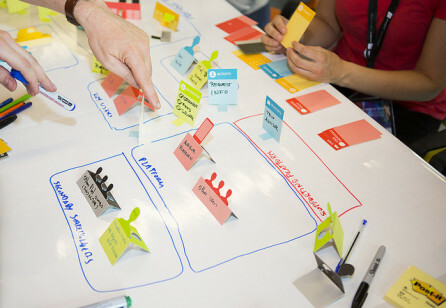 One colour of sticky note should be used to capture their goals as individuals relative to the project, and another to capture their organisation’s goals. KPIs: Next to each goal, in the same colour sticky note, have them define the metrics they are measured on as individuals and the metrics that their organisation reports on. These are the goals and metrics that each stakeholder will care about most during the project. Measurement: Have each stakeholder define how their individual and organisational KPIs are calculated. The service designer shares the customer’s goals and metrics — i.e., KEIs — and explains where the KEIs came from and why they are important. 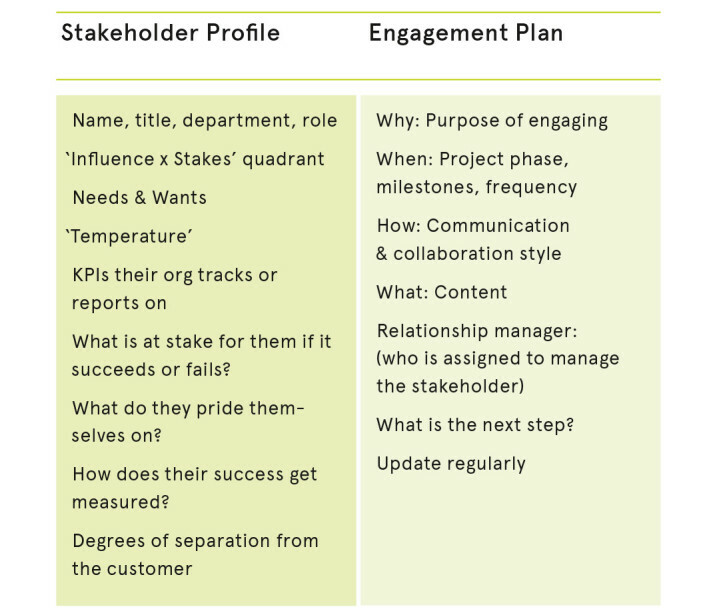 Have the stakeholders map each of the KEIs back to their own KPIs. Have them ask, “Could (or would) my metrics suffer by delivering on this KEI?” If the answer is ‘no,’ then there is no conflict. If it’s ‘yes’ or ‘maybe,’ use the following exercise to resolve them. There is no point trying to coax stakeholders to use the KEIs you identified. They simply don’t have the same goals as your organisation and their success is not measured in the same way yours is. Instead, choose the KPIs that will support KEIs such as ‘low churn rate’ for the sales team, ‘high conversion rate’ for marketing, or ‘reduction in call volume’ for customer support functions. Agree on Alignment Method: Document and publish the agreed-upon goals, metrics, KEIs and KPIs, including the mapping. Refer the team back to them when new disagreements or prioritisations arise. There is no silver bullet for service design project success. 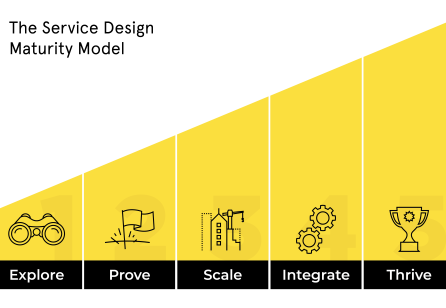 But these tools can empower service designers to keep customer experience at the forefront of what businesses deliver, at all stages of the project lifecycle. 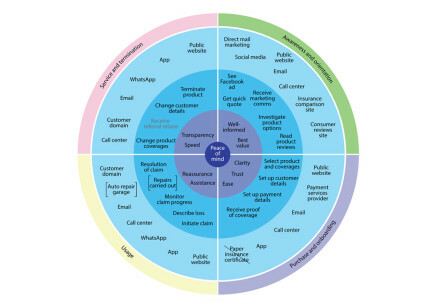 Having worked across sectors — education, healthcare, finance, and tech — her versatile toolkit brings customer-centred strategies to life. She holds an MBA in Design Strategy from California College of the Arts and a BA from NYU. Her work removes business risks from innovation processes for startups to global corporations. Gassia holds an MBA, a Masters in Architecture from Columbia University, and a BS from MIT. She serves on SDN’s National Chapter Board. This article is part of Touchpoint Vol. 10 No. 1 - From Design to Implementation. 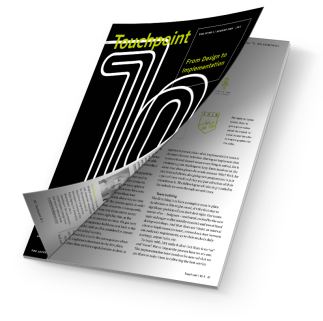 Touchpoint Journal is available to purchase in print and PDF format. Become an SDN member, or upgrade your community membership, to be able to read all articles online and download the full-issue PDF at no charge.